Meanwhile, it looks like Nendoroid Yamada Aoi will be the third Wagnaria staff to serve the Nendoroid realm, joining her seniors Popura and Inami. The lovely Yamada will come with at least three expressions there, along with the broken plate – for her clumsiness. She will be available on June with no pricing info being announced yet. 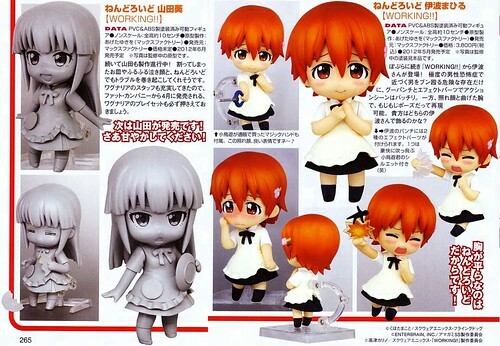 This entry was posted in News and tagged mahiru inami, max factory, nendoroid, working, yamada aoi. ← Happy Chinese New Year 4710! Both! Working is a lovely anime and all three nendoroids are really adorable.. Still hoping for Yachiyo! Prolly gonna drop the nendoroid line soon completely, they are just making the same type, nothing special or unique anymore.